I’ll trade you a 7th rounder for a 1st rounder. Deal? Straight up. No extra picks, just a 2013 7th rounder for a 2019 1st. If you gave up the 1st, you’d be immediately fired after you made that trade, if you were even allowed to. But this trade could happen on Saturday at the draft. Sort of. It’s easier when Josh McDaniels is calling the shots. Sometimes a team is looking to trade up and doesn’t have or want to give up picks that year. The rule of thumb in that scenario is that you give up a pick in next year’s draft from the previous round. Want a 5th rounder this year? It’ll cost you a 4th next year. Because of that, a shrewd GM can put himself in position to get himself a 1st rounder well down the road for peanuts… assuming he’s still around. (Working for an owner like Jim Irsay or Bob Kraft would greatly help). It all starts with having a 7th rounder and a team that really wants a guy, so you get them to give up a 6th next year. Or you could shorten the process by a year by starting with a 6th rounder and get a 5th. From there you just let it snowball over the years. Pro Sports Transactions has a list of all the trades made over the years, an incredible resource. Let’s take a look only at trades where a team gave up a single pick in the current year draft in exchange for a higher round pick the next year to illustrate that this is possible. It’s not easy. 7th for a 6th is relatively common. In 2003 the Eagles a traded a 7th to the Packers for a 2004 6th, in 2006 the Titans traded a 7th to the Colts for a 2007 6th (which the Titans got from the Colts in an earlier trade, so Indy wound up with it’s original pick), in 2008 the Packers traded a 7th to the Saints for a 2009 6th, in 2009 the Eagles dealt a 7th to the Colts for a 2010 6th, in 2010 the Lions traded a 7th to the Eagles for a 2011 6th and in 2012 the Vikings traded a 7th to the Titans for a 2013 6th. 6th for a 5th is rare. 5th rounders that are traded are almost always part of a package when a team trades down/up. In 2008 the Eagles traded a 6th to the Browns for a 2009 5th. I know I said I was only looking at one for one trades, but this is too good to pass up. 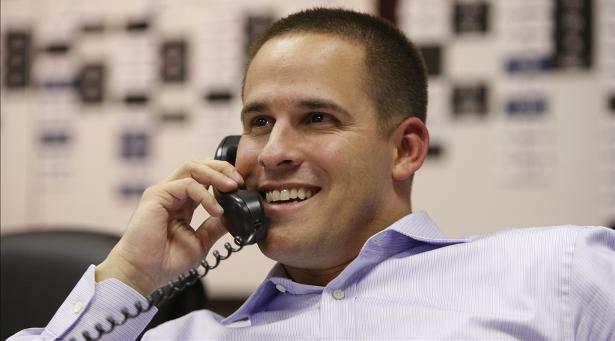 You can also skip a step if you get lucky and trade with Josh McDaniels. The Broncos gave up a 2011 5th rounder for two 2010 7ths. Two 7ths for a 1st ain’t so bad. 5th for a 4th is more common. In 2003 the Colts traded a 5th to the Texans for a 2004 4th, then in 2005 they dealt a 5th to the Eagles for a 2006 4th and in 2010 the Jaguars traded a 5th to the Saints for a 2011 4th, which the Jags got from the Raiders got from the Patriots got from the Broncos got from the Cowboys. Whew. 4th for a 3rd is also rare. In 2002 the Texas traded a 4th to the Falcons for a 2003 3rd, and in 2008 the Cowboys traded a 4th to the Browns for a 2009 3rd. 3rd for a 2nd has happened a few times as well, all by the Patriots. In 2003 the Patriots traded a 3rd to the Dolphins for a 2004 2nd, in 2009 they dealt a 3rd to the Titans for a 2010 2nd and in 2010 they traded a 3rd to the Panthers for a 2011 2nd. Interestingly, the Patriots wound up dealing all three of those 2nd rounders. When Peter King needs to go to his happy place, he thinks of those trades. And finally, 2nd for a 1st, also rare. In 2009 the Seahawks traded a 2nd rounder to the Broncos for a 2010 1st. Josh McDaniels strikes again. As I said, it’s not easy. If it was easy, everyone would do it. But it’s fun to think that with a little luck, it can happen.